The latest iteration of an annual exercise bears noting within the context of broader ties. Over the past week, Malaysia and Brunei have been holding the latest iteration of an annual military exercise. Though the drills are part of a regularly scheduled exercise series, they nonetheless bear noting in terms of the wider evolution of the Malaysia-Brunei defense relationship and broader ties more generally. As I have noted before in these pages, Malaysia and Brunei, two Southeast Asian states and members of the Association of Southeast Asian Nations (ASEAN), have a bilateral relationship that dates back to 1984 when Brunei got its independence from Britain. Both states share a land border and cultural and linguistic similarities, and have attempted to forge greater cooperation over the years in spite of some differences over boundaries and borders. That has continued on into 2018 and following Mahathir’s return to the premiership after a shock election victory by the opposition Pakatan Harapan (PH) government in May. Indeed, in September, Mahathir had paid his first visit to Brunei since reassuming the premiership, which was the second Southeast Asian country following a trip to Indonesia. Collaboration between Malaysia and Brunei includes the defense side as well. And one of the exercises between the two sides is Exercise Malbru Setia, an annual military exercise between the Malaysian Army and the Royal Brunei Land Forces (RBLF). This month, the defense side of the relationship was in the headlines with the holding of the latest iteration of Exercise Malbru Setia. The exercise was held starting from October 19 and took place in Sarawak in East Malaysia, with the closing ceremony held October 25. 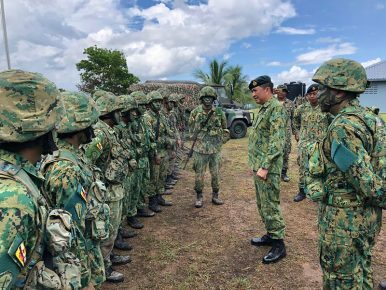 According to Brunei’s defense ministry (MINDEF), the exercise involved a total of 118 personnel from Company C, Second Battalion, Royal Brunei Land Force (RBLF) and 20th Battalion from Royal Malay Regiment (RMR). The exercise was based on advance and attack, with movement starting from Bekenu area to the final attack at the SOP Galah Field. Apart from Exercise Malbru Setia, both sides also held Exercise Mertak Bersatu as well – an exercise conducted by the Malaysian Army and held every two years in Sabah – that kicked off at around the same time. That involved the combined participation of Mortar Platoons by three units from RBLF and 3rd Brigade, 5th Brigade and 9th Brigade from the Malaysian Army. The exercise schedule that played out this year will continue onto next year, during which RBLF will have its turn to host the next Exercise Malbru Setia in 2019. As the schedule plays out in 2019, the drills will continue to be important to watch as one indicator for signs of how the broader defense relationship is evolving. A recent interaction spotlighted the ongoing defense activity between the two countries.